Rock star. Activist. Mother of two. How does Sheryl Crow have time to keep so healthy and fit? Sheryl knows how to eat right and deliciously thanks to personal chef Chuck White, affectionately known as “Chef Chuck.” The duo met while Sheryl was battling breast cancer, which for her, was a wake-up call to eat better. 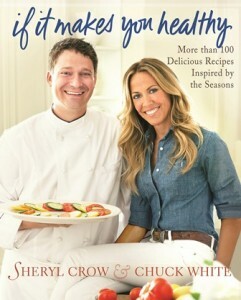 Since then, Chuck has taught Sheryl how to do just that by cooking foods that are seasonal, locally grown, and vitamin-rich to keep her on top of her game and always ready to perform.